Cooking shrimp in the oven has its problems. It is easy to end up with the delicate meat all tight and dried up from the excessive heat, so I always use recipes that protect the shrimp with enough sauce and/or topping. This simple casserole is one of my favorites, adapted from a recipe by Molly Stevens published in a Fine Cooking issue years ago. Fennel, tomato and orange offer a nice base to cook the shrimp, and the layer of bread crumbs on top makes them simply irresistible. Trust me! Position a rack in the center of the oven and heat the oven to 425°F. Heat 2 Tbs. of the olive oil over medium heat. Add the fennel and sauté until slightly softened and lightly browned. Add the garlic and sauté for 1 minute. Add the Triple Sec and orange zest and bring to a boil. Add the tomatoes and their juices, season with salt and pepper, and stir to heat through. 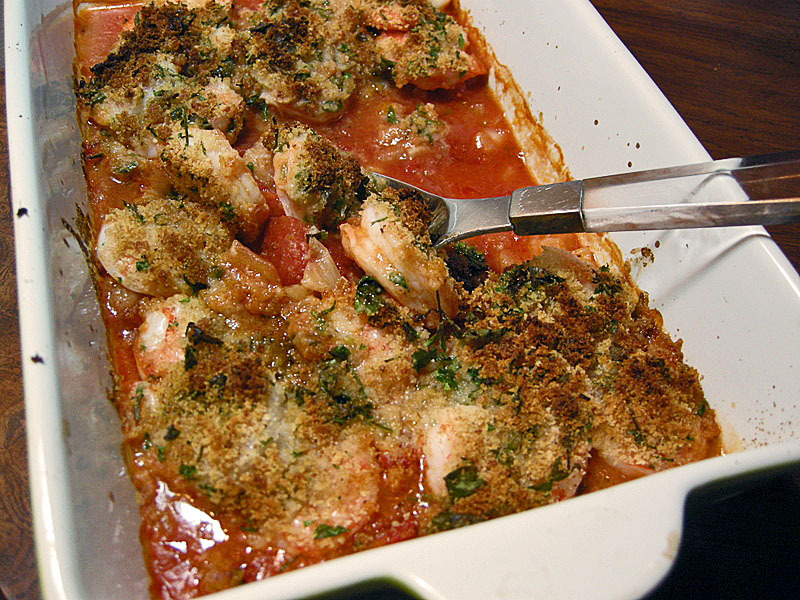 Spread the tomato mixture in a baking dish that will hold the shrimp in a single layer. Prepare the topping by mixing in a small bowl the breadcrumbs, parsley, remaining 2 Tbs olive oil, and salt and pepper to taste. Place the shrimp on the tomato mixture, and sprinkle with the breadcrumb mixture. Bake until the shrimp are cooked through – 12 to 15 minutes. Comments: If you want to make this recipe even easier for a weeknight, prepare the tomato/fennel base in advance and simply re-heat it before placing in the oven. It is important that the sauce is already warm when it goes in the oven, that helps coaching the shrimp into cooking evenly and remaining tender and juicy. While you heat the oven, make the topping, and dinner will be ready in less than 20 minutes. A side dish of pasta, rice, or just a hearty piece of bread with a salad will complement it perfectly. Aqueça o forno a 220° C. Aqueça 2 colheres de sopa do azeite em fogo médio. Adicione a erva-doce e refogue até que fique ligeiramente amolecida e comece a dourar. Coloque o alho e refogue por 1 minuto. Adicione o Triple Sec e as raspas de laranja e deixe ate’ ferver. Adicione o tomate e seus sucos, tempere com sal e pimenta, e mexa até estar quente. Espalhe a mistura de tomate em uma assadeira que permita espalhar o camarão em uma única camada. Prepare a farinha para cobertura misturando em uma tigela pequena a farinha de rosca, a salsinha picada, 2 colheres de sopa de azeite, sal e pimenta a gosto. Coloque o camarão no molho de tomate e polvilhe com a mistura de farinha de rosca. Asse até que os camarões fiquem cozidos – 12 a 15 minutos. I’ve made this recipe and it is so good. Another FC recipe that’s similar is Shrimp and fennel with feta cheese. The feta needs to be good quality; I like french feta or Mt Vikos-supermarket brands will not do. That’s probably the exact recipe I adapted here, because I remember the original as having feta. You are absolutely right, the best possible quality feta is a must for that dish. Oh, what a delicious recipe this was! Made it exactly as you did, my husband uses Triple Sec in his drinks and was kind to share some in the name of a tasty dinner. Glad you enjoyed it, Margareth! Nothing like having an understanding husband!